I’m trying to clean out our freezer, because… you know. We’re moving. Way at the back I found a giant four-pound bag of strawberries that I must have bought a year ago. Thus endeth the story of why my children got fruit crisp for breakfast. Moments after this picture was snatched the pan was empty. Everybody likes a fruit crisp. I developed this recipe in Japan as an answer to the question, “How do you get small children to eat large amounts of fruit, especially when most of our fruit is frozen?” (Hint: bake it with sugar. The answer to these questions is almost ALWAYS ‘bake it with sugar.’) There is sugar in it, but I tried to keep it to a quasi-low level so I wouldn’t feel guilty calling it breakfast, it’s definitely not as sweet as a regular dessert. It’s delicious, though. Preaheat oven to 375F. In an 11×7″ pan, mix the filling ingredients. 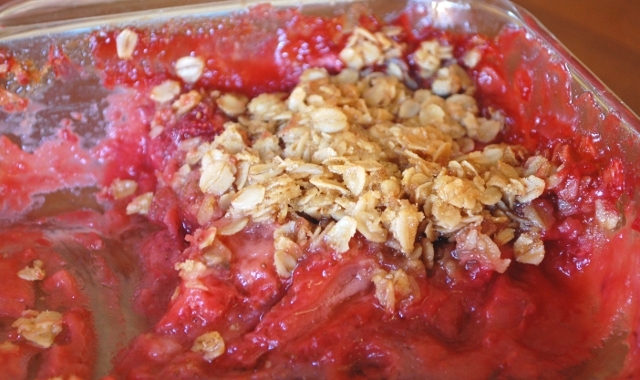 In a bowl, mix the topping ingredients with a fork until it makes nice crumbles and sprinkle it over the top. Bake for 45 minutes; serve with whipped cream or vanilla ice cream if you’ve got them. Enjoy! Why yes, we do have enough strawberries left for another batch. Anyway, (as a random aside) I made a couple of necklaces since last night. Greg and I worked for five hours straight, turning the garage upside-down to make sure we found everything that we wanted to go out to the bulk trash pickup, and in the process I found a couple of pieces I’d meant to make into necklaces a few months ago. I put the little porcelain maneki neko onto a chain last night, and then made some garnet and gold jade links for the torii gate this morning. It’s not much, but it makes me happy. I love making beautiful things. Sometimes I think jewelry has a lot less to do with making women beautiful and a lot more to do with carrying beautiful things along with you. I bought the maneki neko at Fire Mountain Gems (they have a lot of different ones), and I found the torii gate at Michael’s on clearance and just had to have it. 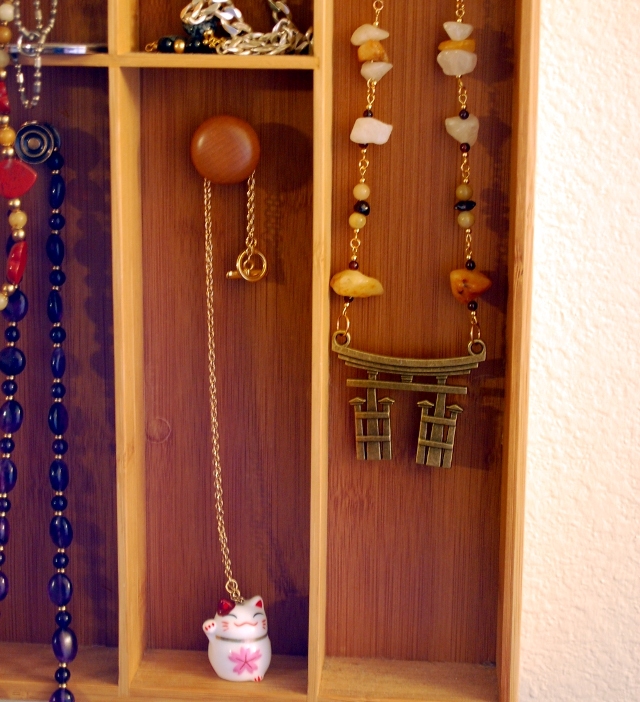 You might recognize the necklace holder they’re sitting in: I made it a few years back, and honestly I think all the trouble I had with it is – in retrospect – hilarious. At least there’s that, right? This entry was posted in Other Projects, Recipes. Probably less sugar in it than a bowl of Coco Frosted Sugar Bombs! Well I sure hope so, haha! I’ll bet they’d think they’d gone to heaven if they had fruit shakes or smoothies for breakfast!